What is numbness and what causes it? "pins and needles" feeling or a tingling "fallen asleep" sensation. This impingement may have many different causes, the most common being a subluxation (misalignment) of a vertebra or herniated disc. 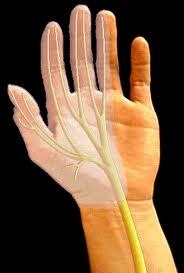 This subluxation can also cause pain throughout the body because of the pressure put on the nerve. Other conditions may cause numbness as well that may be less common such as spinal canal stenosis, diabetes, tumors, stroke, etc. Numbness can be short lived or occur for long periods of time depending the severity of the impingement and possible damage to the nerve. Common areas of numbness include shoulder, arms, leg and feet. In order for the sensation to return the impinged area must be eliminated. A chiropractor will be able to remove the pressure from the nerve being affected through manipulations. Contact Dr. Rising at Gallatin Valley Chiropractic if you are experiencing numbness or have any questions about your symptoms.